Please tell me this is not a dream! Yes, High Cut is brilliant enough to attract people through the easiest way: identify what people are addicted to right now and use that for raking in their profit. All of it, thanks to the one who suggested the idea to the magazine, The Moon that Embraces the Sun‘s fans are having their dreams to become a reality! The child (I think it’s more suitable to call them teenage) actors are back, but no longer donning their sageuk garbs. 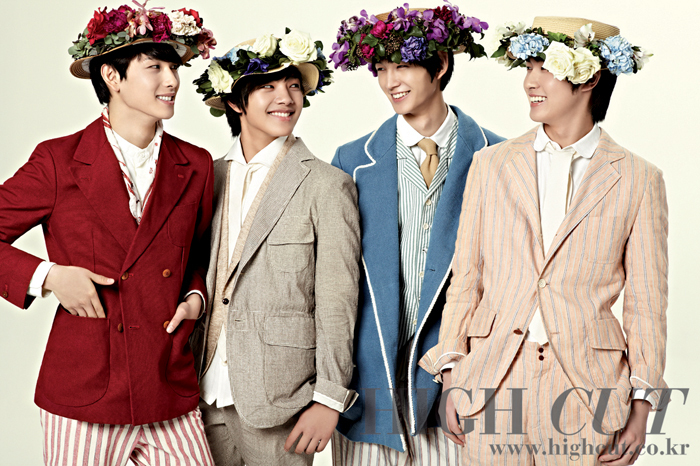 They are all turning into a ‘real’ flower boys, or boys wearing flowery hats. From the left: Siwan (Heo Yeom), Yeo Jin-Gu (Lee Hwon), Lee Won-Geun (Woon), and young Lee Min-Ho (Prince Yangmyung). This photo shoot are for Vol 70 of High Cut magazine.